Hi Keely — Great question. And we all have asked this before when learning about coupons. 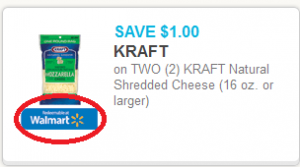 When it shows “available at Walmart” or “redeemable at Walmart” it’s just Walmart paying to have their logo seen and letting you know you can use the coupon there, like a suggestion. It is a manufacturer coupon than can be used any place that takes coupons, NOT just Walmart. So, yes you can use it at Walgreens, Target and any other store. See the image below with how it will print on the coupon. Missing are the words “only” so use it anywhere. Jen, I also have had problems using the coupons with the available and redeemable at walmart coupons. I recently tried to use a coupon for the diet pepsi deal at walgreens and was told at two different walgreens that I could not use it there. Some cashiers will just let it go, but some will not. I asked for a Manager and was still not allowed to use the coupons. Also, lately there seems to be alot of these coupons with the Walmart logo available for print. Hi Jamie — I am so surprised you are having some of these problems, especially at Walgreens. I use them all the time at Walgreens — the key is it has to say manufacturer coupon on top and show redeemable at…and not redeemable ONLY at. Honestly, I would find out the store number and call Walgreens corporate office about this. These are regular manufacturer coupons that Walgreens will get reimbursed for,and there is NO reason why they shouldn’t allow the coupons usage. 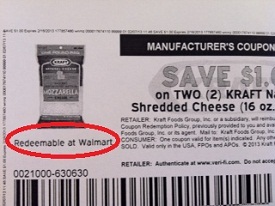 Oh and FYI – Many of the coupons on coupons.com on screen will show Walmart, but do not print with Walmart mentioned.